Patriarch Joachim (secular name Ivan Petrovich Savyolov), was the Patriarch of Moscow and All Russia from 1674 to 1690. He continued the policies of liturgical revision instituted by Patriarch Nikon, but stood against the increasing trend of Westernization within the Russian society during the late seventeenth century. He founded the first higher education institution in the Patriarchate. Ivan Petrovich Savelov (Russian: Иван Петрович Савёлов) was born in 1620. He was descended from the nobility of Moscow. In his youth Ivan followed his aristocratic origins and entered the military service. After finding military service unsatisfactory, John left the service in 1655 and entered a monastic life at Kiev-Mezhigorskaya Monastery. There, he received the name Joachim upon his tonsure as a monk. In 1657, Joachim was sent to Iversk Monastery near Novgorod by Patr. Nikon of Moscow. Shortly thereafter, Joachim was transferred to the re-built St. Andrew's Monastery in Moscow, at the request of the boyar Rtishchev[], before moving to Kelarev Novospassky Monastery. Joachim was elevated to the dignity of archimandrite in 1664, and appointed igumen of the Chudov Monastery in Moscow. In 1672, Archim. Joachim was elected Metropolitan of Novgorod. During 1673, Metr. Joachim sent Archimandrite Macarius of Novgorod to mediate a disturbance among rebellious monks at the Solovetsky Monastery. On July 26, 1674, Metr. 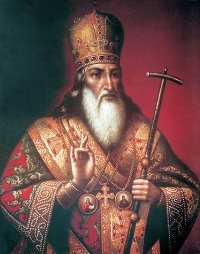 Joachim was elected Patriarch of Moscow following the death of Patr. Pitirim. Although Patr. Joachim had participated in the council which deposed Patr. Nikon, Patr. Joachim continued Nikon's policies concerning the Old Believers. Patr. Joachim also was a defender of the Church and took a strong position against the introduction of Western ideology and practices into Russian society. As the seventeenth century was ending, two religio-political groups began to form, one favoring westernization/ Latinism led by Sylvester Medvedev, abbot of Zaikonospassky Monastery in Moscow, and the other by adherents of Orthodoxy led by Patr. Joachim. To bolster the Orthodox position, Patr. Joachim sought, in 1685, academic help from the Eastern patriarchs that came in the person of two intellectual Greek monks, the brothers Joannicus and Sophronius Likhud. Patr. Joachim placed them at the head of the "Greek" college, originally founded in Moscow in 1679, that became known as Greek-Latin School, the forerunner of the Moscow Theological Academy, with directions to refute the Latin centered writings of Medvedev. The confrontation became bitter, to the point that Patr. Joachim convened a council to condemn Medvedev. Having the support of Tsar Peter I after he had come to the throne following a palace coup against his regent and half-sister, Sophia, Medvedev was tried and executed a year after Patr. Joachim died on March 17, 1690. Patr. Joachim was buried in the Dormition Cathedral in the Moscow Kremlin. ↑ Pavel Tikhomirov, Kafedra Novgorodskikh Sviatitelei (Novgorod, 1895), vol. 2. This page was last edited on February 9, 2013, at 08:47. This page has been accessed 7,242 times.